Safety support bar, fits Ocean XL wide models. 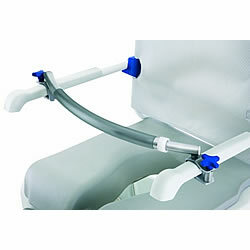 Bar mounts across arms on Ocean chairs, provides barrier or grab bar while seated, white with black foam grip area. Lifts up for entry and exit from chair. Bar mounts across arms on Ocean XL shower chairs. White with black foam grip area. Lifts up for entry and exit from chair. Only fits Ocean XL wide models. Please note: By law, hygiene-related product cannot be returned. Due to this fact, we recommend that you discuss your specific needs with an Adaptive Living Representative and your personal healthcare professional(s) BEFORE purchasing any hygienic product. This item is a NON-RETURNABLE hygiene-related product.